Gold vermeil or vermeil jewelry is one of the hottest trends right now. It is the perfect balance between quality and accessibility and it looks gorgeous. When you buy fine jewelry metals, vermeil should be on your shopping list because of its many qualities. Want to know what those are and discover more about gold vermeil? Keep reading to find out. As you may have guessed, the term “vermeil” comes from French. If you happen to find “silver-gilt” jewelry, you should know that it is the same thing. And what exactly is that? In short, a sterling silver jewelry piece dipped in gold. When a sterling silver jewelry piece, let’s say a necklace, is plated with a layer of gold, then it means you have a gold vermeil piece. The process that allows jewelry makers to plate a silver piece with gold is called electrolysis. Just like a solid gold piece, a vermeil one can contain gold of different types. It can be dipped in 10k gold, 14k and so on. You should also know that for the U.S. the minimum purity of gold in a vermeil piece needs to be 10k. If it’s not, then the seller can’t brand the jewelry piece as vermeil. What is the difference between vermeil & gold plated jewelry? Many people aren’t aware of the differences between gold vermeil and gold plated jewelry. But these differences are essential. First things first, gold vermeil is actually precious silver with a gold layer on top of it. The core metal has to be silver, otherwise, jewelry shops can’t sell the piece as vermeil. With gold plated jewelry, however, the core metal can be anything, from brass to copper and stainless steel. Secondly, for gold vermeil, there is a requirement for the thickness of the gold layer. A vermeil piece needs to have a gold layer at least 2.5 microns thick. Gold plated jewelry, on the other hand, doesn’t have this requirement and the thickness of the gold later is up to the jeweler. Last, but not least, there is a difference in price. Usually, gold vermeil is more expensive than gold dipped jewelry simply because its core metal is silver and because the gold layer may be thicker. Vermeil jewelry pieces are, usually, durable and great to wear every single day. Of course, the durability of a gold vermeil piece depends on the thickness of the layer of gold and its karat. A piece with a gold layer of 5 microns will be more durable than one with a thickness of 2.5 microns. However, when it comes to the karat type, things may not be as you expected. Since gold is a soft metal that scratches easily, the higher the karat, the lower the durability of the piece. A 14k gold vermeil piece will be far more durable than a 22k one. What are the benefits of gold vermeil? Besides its accessible price, gold vermeil also comes with other benefits that are hard to match by other jewelry types. An important advantage of gold vermeil pieces is that they can be great even for people who suffer from nickel allergies. If you are one of those people, then you know that, generally, gold plated jewelry gives you rashes because of the high nickel content. However, vermeil pieces don’t usually contain nickel which can be great for you. When buying gold vermeil, you should still ask the jeweler if there is any nickel in the piece, just to be safe. Another great advantage of vermeil is that it offers you the finesse of fine jewelry and the warm shimmer of gold at a lower price than solid gold jewelry. Gold vermeil is also durable and great to wear every day. Last, but not least, even though vermeil means gold on silver, it can offer a lot of diversity. You can buy rose gold vermeil, white gold and, basically, any of the colors of solid gold jewelry. Since Ana Luisa offers you fine quality designer jewelry at fair prices, in our collections you can find gorgeous and unique gold vermeil pieces. 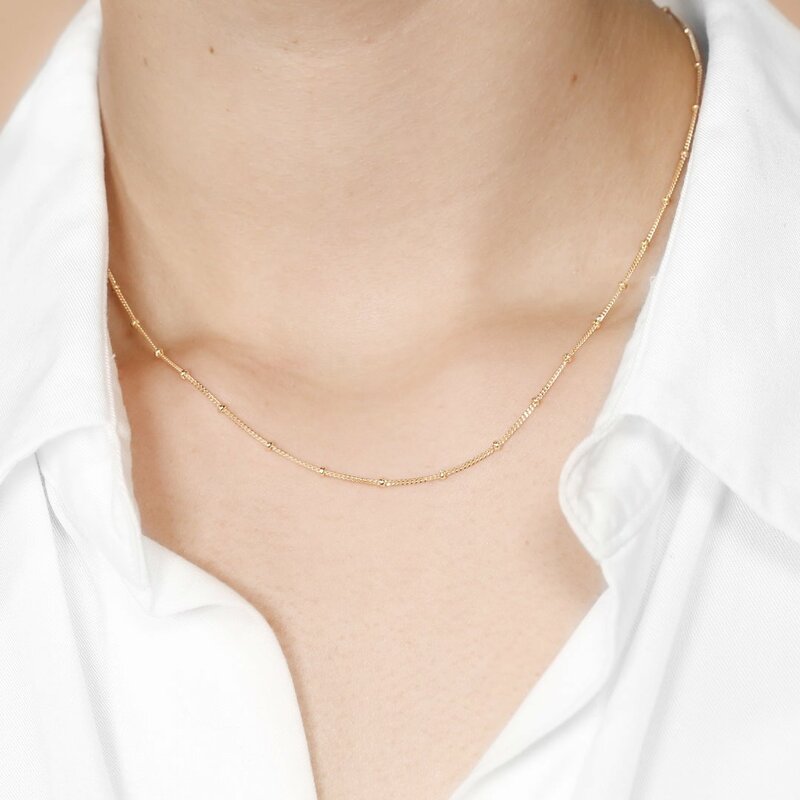 Whether you want a delicate rose gold vermeil necklace or a classic yellow gold one, Ana Luisa is the place to check when looking for unique vermeil jewelry. Go ahead and visit our online jewelry shop to see our collections and fall in love with our beautiful and unique designs. You should also know that each creation is limited-edition so you can be sure of the uniqueness of your pieces. If you want to find out more about jewelry, discover useful buying & maintenance guides, as well as expert jewelry styling tips, check out our other articles. We publish daily articles so you have a lot of reading to do.